Upper Riccarton Library will host an exhibition of photos of Chung Wah Restaurant from Saturday 26 January to Friday 8 February. Celebrate the history of an iconic Christchurch restaurant through this special photographic exhibition, and share your fond memories in a sign in book. Chung Wah Restaurant was the biggest Chinese restaurant in New Zealand in 1984. It had expanded from Shanghai Café, to Chung Wah I and then to Chung Wah II in twenty years. The Pagoda-style Chinese restaurant Chung Wah II was formally opened on 19 September 1984 at 63 Worcester Boulevard. The Chinese ambassador to New Zealand, Mr Qin Lizhen, and the Mayor of Christchurch, Sir Hamish Hay, declared the restaurant open, to the delight of nearly 500 guests. 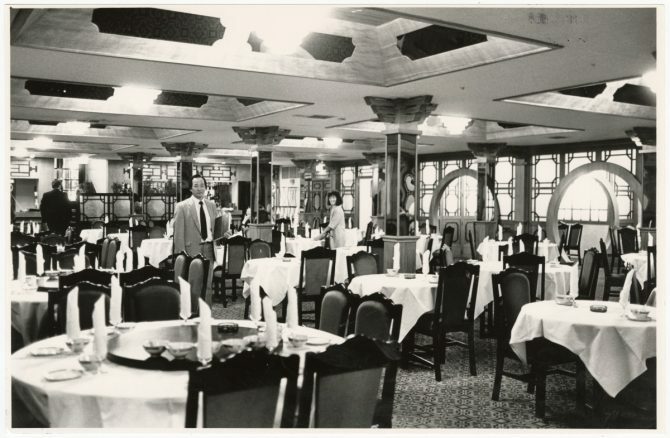 According to The Star, it was the biggest Chinese restaurant in New Zealand - its main dining room could seat up to 600 people and the upstairs function hall catered for 350. The building was formerly the Christian Science Church, designed by Heathcote Helmore and opened in 1935. 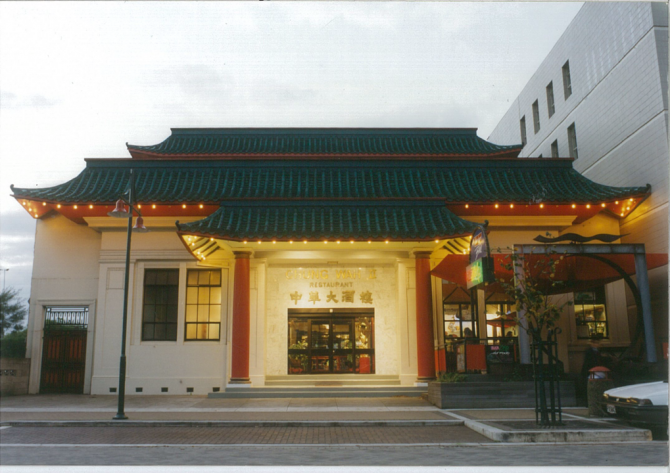 Mr Toi Yee Chan bought the property in 1983 and converted the façade of the building to be the oriental facade despite strong opposition from Mr Don Donnithorne. The storey at the rear was extended to the front to provide necessary toilet facilities. The restaurant was designed by a Singaporean architect Robert Ling, but Mr Chan designed the style of the restaurant and the interior with his help. The exterior boasted 7000 green tiles, shipped specially from China, on the pagoda style roof. This opulent restaurant was further enhanced by the addition of red carpet over the two dining floors and throughout the restaurant. 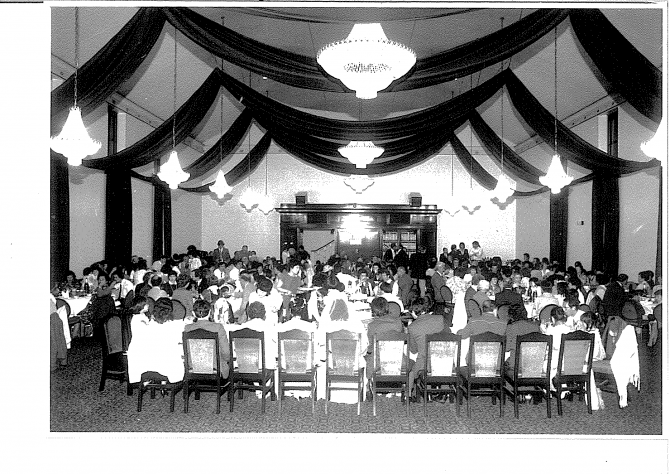 Chung Wah II hosted many celebrities over the years: the NZ Radio Awards Dinner, a charity cricket dinner for Imran Khan, and The Miss Canterbury 1987 competition were all held there. The First Church of Christ, Scientist building. 10 December 1983. Christchurch Star archive. In copyright. 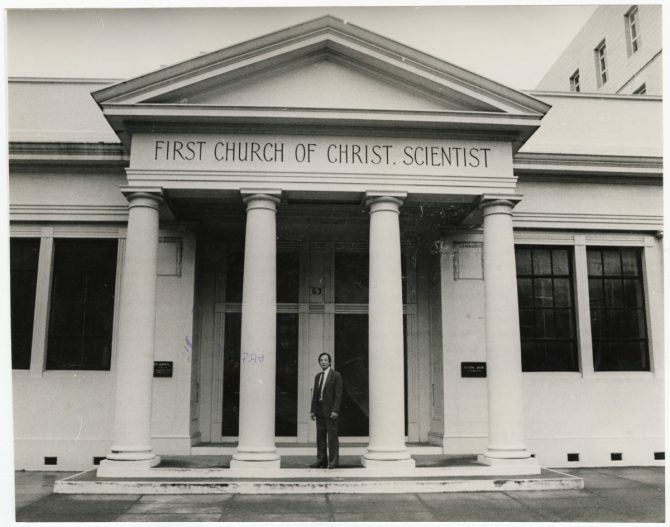 CCL-StarP-01527A https://discoverywall.nz/media/19591 Mr T. Y. Chan stood outside the First Church of Christ, Scientist building on Worcester Boulevard following its purchase by Mr Chan for conversion into the Chung Wah 2 restaurant. Chung Wah 2, Worcester Boulevard. 8 March 1988. Christchurch Star archive. In copyright. CCL-StarP-01528A https://discoverywall.nz/album/1684/19601 Interior of the dining area at Chung Wah 2 Asian restaurant on Worcester Boulevard. Stood in the centre of the dining area is the restaurant's owner, Mr T. Y. Chan.